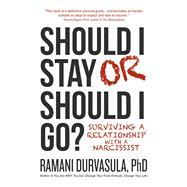 Unromantic, incisive, and wise, Should I Stay or Should I Go is the salvation for anyone who is stuck in a relationship and needs help staying or going. Do you feel like you are talking and talking and your partner is never listening? Do you feel like you keep saying the same thing over and over again? Does your partner make promises, only to break or betray your trust repeatedly? Is your partner controlling or just plain mean? Have you read every relationship book out there, practiced your communication skills and still feel unheard or neglected? Are you done with second chances? We live in a world of romance and rescue—where everyone believes love will conquer all, and the more we put up with, the more loving we are being. It doesn't work that way. Sometimes we choose mean people, and before long we are in so deep we don’t know whether we are coming or going. One day you want to fight harder and the next day you are ready to pack it in, and the next day you want to fight harder. Should I Stay or Should I Go is a survival manual, a guidebook—and a shot of reality. Some people will never change, and kissing frogs is the stuff of fairy tales, not real life. The Beast never turns out to be a nice guy (or gal). This is a book that breaks down what mean people do to us, how they do it, and what we can do to survive.